PLANO, TX--(Marketwire - August 4, 2008) - Invensys Process Systems (IPS), a global technology, software and consulting firm, has released the newest version of SimSci-Esscor's INPLANT™ simulation software, a program that rigorously simulates multiphase flow in plant utility and relief networks. INPLANT version 4.1 provides the power and flexibility to model applications ranging from a depressuring study of a single vessel to the design and rating of a complete cooling water network for an entire refinery or petrochemical plant. The latest version of INPLANT software now incorporates the recently introduced SimSci-Esscor SIM4ME Portal, which enables the use of INPLANT software via a Microsoft Excel interface. 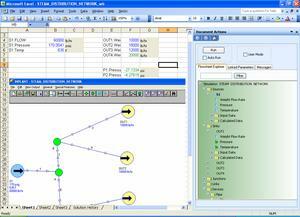 The SIM4ME Portal constructs a simple, bidirectional communication link between the steady-state simulator, SimSci-Esscor's INPLANT, PIPEPHASE™ or PRO/II™ simulation software, and a Microsoft Excel spreadsheet. The SIM4ME Portal enables developers to create an Excel spreadsheet that is INPLANT aware, allowing users to execute an INPLANT simulation from within an Excel software application. "By combining the SIM4ME Portal with INPLANT software, we make it very easy to create custom interfaces in the Excel spreadsheet software without having to code a single line of the Visual Basic development system," said Joseph McMullen, PES Product Manager for IPS. "INPLANT version 4.1 users can now drag and drop multiphase flow model parameters, such as relief valve discharge coefficients, fluid densities, pipeline diameters and solver options, directly into Excel spreadsheets. The ability to access any model parameter easily, change its unit of measure and determine its status as either an input or calculated value from within the Excel software puts the user in the driver's seat for data manipulation and integration." Microsoft Excel spreadsheet software provides the ideal platform for engineers to create an operations interface that can be used by INPLANT software experts and non-experts alike, tapping the user's imagination in ways that are all but impossible with a pre-configured interface. Communication between the flow simulator and Excel spreadsheet software is bi-directional and requires absolutely no coding skills on the part of the user. INPLANT software version 4.1 is available immediately. Visit www.simsci-esscor.com for more information. Invensys Process Systems (IPS), headquartered in Plano, Texas, is a global technology, software and consulting firm leading significant change in process manufacturing, plant optimization, business operations and enterprise performance. IPS clients are some of the world's most important industrial organizations -- companies that operate large oil refineries; plants that process chemicals, gas, LNG, power, pharmaceutical and minerals; and pulp and paper mills. IPS solutions, used at over 50,000 locations across the globe, include field devices and controls from Foxboro and Triconex, advanced applications from SimSci-Esscor, operations management from Avantis, and the world's first truly open enterprise control system, InFusion™. The company's nearly 7,000 employees integrate these capabilities to create solutions that impact and increase efficiency, boost productivity, and accelerate performance. These results help industrial companies run safer, operate more efficiently, and extract useful knowledge from their operations to make faster, better decisions. To learn more about IPS visit www.ips.invensys.com. The Invensys Group (www.invensys.com) is headquartered in London and is listed on the London Stock Exchange (ISYS.L), with approximately 25,000 employees working in 60 countries. Invensys, Avantis, Foxboro, SimSci-Esscor, Triconex, InFusion, INPLANT, Sim4me, Pipephase, PRO/II, Eurotherm, Wonderware, and the IPS logo are trademarks of Invensys plc, its subsidiaries, or affiliates. Microsoft, Excel, and Visual Basic are either registered trademarks or trademarks of Microsoft Corporation.